The Station today is in St. Lawrence‘s in Damaso—a church built by Pope St. Damascus in honor of the martyred deacon. It was one of the first parish churches in Rome and was rebuilt in the late 15th century by Bramante, and has since been restored several times. Pope St. Damasus‘ relics are beneath the altar. Today the church is part of the Cancelleria, or the chancery, and houses the Holy Father‘s Tribunals: the Roman Rota, Apostolic Signatura, and Apostolic Penitentiary. San Lorenzo in Damaso, dedicated to St. Lawrence the Deacon – again! – is located at the site of the ancient titulus Damasi, one of the twenty-five original parishes of Rome. The first church was built by Pope St. Damasus (366-384) over his house near the Theater of Pompey. It was here that he founded his public library, so an inscription reads: “I have erected this building for the archives of the Roman church; I have surrounded it with porticoes on either side, and I have given it my name, which I hope will be remembered for centuries.” This ancient basilica and palace were demolished in 1484 to make room for the new Palazzo della Cancelleria. Considered a masterpiece of Renaissance architecture, the palazzo was built for Raffaele Cardinal Riario, nephew of Sixtus IV (1471-1484), by an unknown architect; the records were lost in the sack of 1527. It is thought that Bramante may have helped at a late stage, possibly designing the beautiful courtyard. Since the sixteenth century it has housed the presiding cardinal and the offices of the papal chancellery, which has given it its name of Cancelleria. The palace is still the property of the Vatican and contains the offices of the various Tribunals of the Roman Curia: the Apostolic Penitentiary, the Supreme Tribunal of the Apostolic Signatura, and the Tribunal of the Roman Rota. 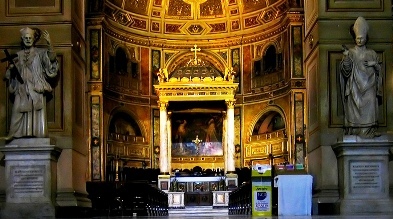 The present basilica is incorporated into the fabric of the palace. It does not occupy the same site as the original San Lorenzo did; not only is it farther west than the former, but neither does it face onto the Via del Pellegrino. Nevertheless, the Renaissance church is large and spacious, having a nave, two aisles, apse, and an interesting double portico in the front forming a vestibule; perhaps this alludes to Saint Damasus’ porticoes that surrounded his ancient church. During a restoration after a fire in 1944, inscriptions were found indicating that this was the ancient site of the barracks of the Green Company of Charioteers, thus explaining another ancient name for the church, “San Lorenzo in Prasino” since prasinus, as you probably know, means “leek green” in Latin. Under the high altar, which is a work of Bernini, are the remains of Pope St. Damasus and many others, including the martyr St. Eutychius and St. John Calybites and St. Hippolytus. At the rear of the left aisle is venerated a beloved image of the Black Madonna, of Byzantine origin. In a chapel off the right aisle is a miraculous, 14th century crucifix before which St. Bridget of Sweden often prayed while she lived here for a period of time. Above the colonnades is an interesting row of paintings depicting scenes from the life of St. Lawrence.